Sometimes change is in order and we felt that change was needed in the guest room. A bit "fussy" with layers of curtains, mini blinds, and stacks and stacks of pillows. This is the before --the drapes are really green but they've faded to a gold!!! And the window seat -- filled with pillows -- so many that there isn't much room to sit and enjoy the window seat! And today, the Sunday before Christmas -- was spent on a ladder, taking down all of the "holders" (for mini blinds, blinds, drapes, and roller shades) and then putting up the two inch Venetian blinds that we bought for the room. And then I moved things and cleaned really really well! For Daughter Sarah and her Andy are coming home for Christmas! The light in the room is amazing with the four windows covered only in blinds which are open -- sunlight steams in so it is a "light and happy" room rather than a "dark and dreary" room. 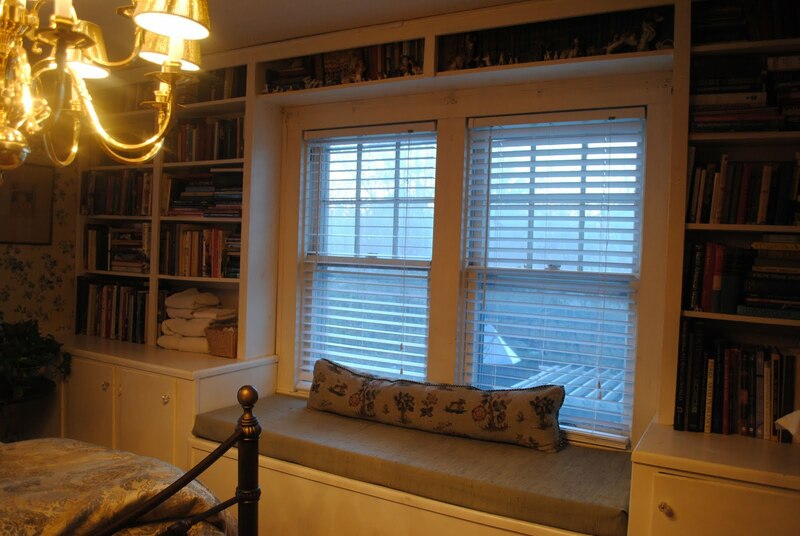 I am happy with the small changes -- putting the pillows away and taking down the heavy window coverings. I hope Daughter Sarah and her Andy will like the changes as well! It's Monday and so it's time for Met Monday with Susan at Between Naps on the Porch. With Christmas activities taking up so much time, I was surprised that I had time for a metamorphosis this week. Let's see what else everyone has been up to! Huge change! It looks wonderful and I'm sure it will be very much enjoyed. Light, bright and room to put your suitcases and stay awhile. Sure Sarah will be happy to be home for Christmas and will love the change! Have a Merry Christmas, dear! Lovely makeover and I think the blinds are a great change. I hope you and your family have a Merry Christmas. Looks nice! Without the drapes, one notices the wallpaper pattern more. Amazing how you squeezed in this minor makeover in the middle of the holiday rush! Family coming home, though, is certainly reason enough. Enjoy Christmas...and the new, sunnier room! Martha, the room looks beautiful. The old saying "Less is More", really works here. I know you will be glad to see your daughter. Merry Christmas! I like the single pillow much better. More room to relax. Dropping by from Met Monday. What a lovely, bright guest room you have now, Martha. I like it very much. I'm sure your daughter and son-in-law will love it too! Great change but it still looks cozy and inviting. 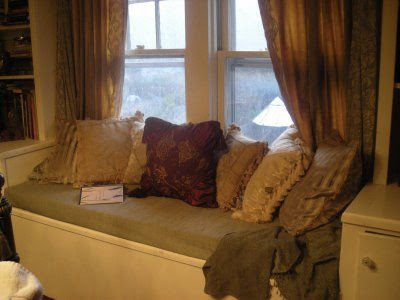 That window seat looks good enough for a cup of tea and a good book. I had an art teacher that always said 'less is more'. Great words put to work beautifully here! I really like the change . I love the window bench and chandy in bedroom. Your special guests will feel so welcome! No one will be in a hurry to leave. I love the change! I'm glad I found your blog, following you now. 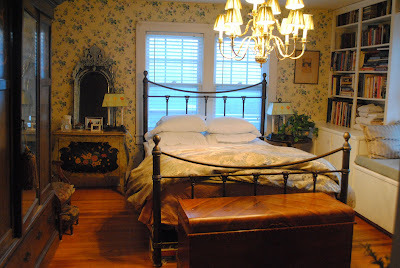 I am doing a bedroom makeover too! I love the venetian blinds. 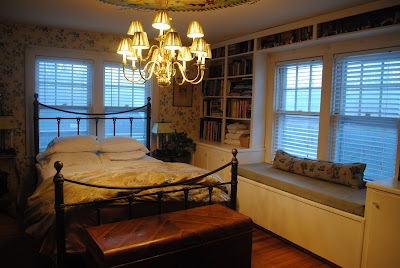 YOur iron bed is gorgeous and how about the built in bookcases, what a great guest room. What a lovely room! Such a beautiful bed and I love the light coming in. I bet your guests will never want to leave! That looks beautiful Martha. It certainly does look a lot more light and airy. I love the blinds! Love your changes... I've been paring down myself a bit here and there. Let the light shine in! Merry Christmas! It looks fabulous! 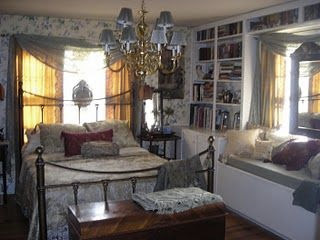 Of course, it's a lovely room to begin with -- but I do like the new look -- very chic! I had to smile; our yellow guest room also had a bombe chest, and similar built-in shelves where we also keep books and towels! Martha, we just might have been separated at birth, you and I. Have a wonderful visit with your daughter. My older is home, the younger coming in for the holidays tomorrow. It's just grand to be together.